Frass (drywood termite droppings) is positive evidence of a drywood termite infestation. 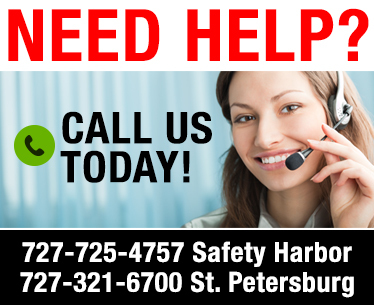 Severe damage to wood is indicated by a hollow sound when tapped. 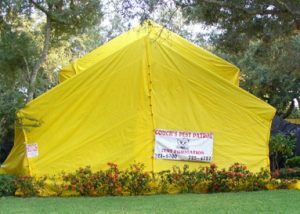 If drywood termites are found, a tent fumigation with a gas fumigant is the sure way to get rid of this pest. A fumigation treatment which spans 2 nights, eliminates all pests, stopping all damage. The fumigant penetrates all structural wood, trim, furniture and wood studs in the home. There is also a liquid chemical treatment with Premise II® for drywood termites that may be an option. This treatment, while it takes care of the general area treated, it does not have the overall effect that a tent fumigation has. 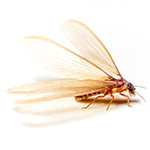 All our termite work is guaranteed for one year from the initial service date. The warranty may be extended on an annual basis for a fee and term length which is determined on the original contract. The warranty ensures that Couch’s will return and re-treat as needed for your specific termite issue at no additional charge as long as the warranty is current and in effect.